Guides will be available from Embassy and other Annuale locations from 8 June. This project takes the form of an epic feature length narrative film, and accompanying novella. The narrative is based on a series of 411 email scams. An exhibition of paintings, drawings, etchings, illustrated dresses and objects alongside a series of events and performances. A collaborative performance and installation of a Portable Black Hole made from the darkest material ever made. and an edition, distributed from Embassy and various other Annuale locations. The sixth edition of Neon John, an ongoing collaborative project. This edition forms a conversation on two forms of filmmaking and their narrative, constructions, meanings and characterisations and continues an ongoing examination of identity, its documentation, theft and distribution. Social Growth is part of Annuale 2012. Staged as part of this festival it presents work related to public and social spaces and the relationships with humans, non-human species, waste objects, materials and various ghosts within these spaces, based on desire and existing automatisms. Embassy is supported by Creative Scotland. Dean Kenning's project is supported by The Elephant Trust. A bespoke love letter service, which each participant receives on completing and returning a questionnaire to the artist, distributed from Embassy and other Annuale locations. Signs at various unlikely or less picturesque locations beyond the city centre and maps distributed from Embassy and various other Annuale locations. 8. Jelly and ice cream when Thatcher dies? A publication including text and images from women in art and politics, distributed from Embassy and various other Annuale locations. A Non-continuous Column, after Endless Column by Constantin Brancusi, touring to various Annuale locations. An internet-based research project into a correlation of narratives within literature and popular science, initiated as a response to their exhibition, Within the Space of. and catalogues distributed from Embassy and various other Annuale locations. Limited edition exhibition catalogue, online exhibition walkthrough, interviews and online gallery. Originating at the gates and moving with visitors to the degree show into the Main Building and beyond, a participatory and experiential work exploring fixed and fluid phenomena during which the Annuale and the eca Degree Show will overlap. This project, curated by Chris Biddlecombe and Janie Nicoll, explores visual images that are connected to music, the demise of vinyl records and their recent underground rebirth, how expectation can be better than the product, and when does a sound become an object to hold and treasure. Each artist has produced a 12", double-sided artwork, displayed in a plastic sleeve. Doctrine of Signatures brings together eight artists who make an interpretation of their experience walking, talking and being inspired while exploring the John Muir Country Park in Dunbar. 10 June and 16 June 2-4pm. A collaborative project, aiming to create a series of 'artefacts' or imagined objects. The project will explore how commonplace or overlooked articles could be visual motifs that approximate the visual traditions of a 'displaced' culture, or micro movement. That Distance Was Between Us is derived from an ongoing study of photography and the notions of distance and apathy the constant bombardment of images often induces in the spectator. It seeks to question this position by manipulating and appropriating narratives and creating scenarios that are uncomfortable or challenging to confront. 18. Ding, Dong, the Queen is Dead! An installation, video and poem examining the glue that sticks us all together, as well as subjects like rules, strategies, hierarchy and power. ESW and Outgrowth_org are pleased to present a video essay by Tomasz Kozak who is regarded as one of the most intriguing Polish artists. His work explores the dark anachronisms present in the Western subconscious. While researching archetypal signs and symbols Kozak exploits demonic discourses underlying our culture. The event is organised with the support of the Polish Cultural Institute. It's Hard to Find a Good Lamp is a group exhibition that takes its title from Donald Judd's 1993 essay. The exhibition brings together contemporary artists whose work investigates the boundaries between art, furniture and interior design. An exhibition of collage and works on paper relating to language, the human body and architecture. An exhibition of works by artists from across Europe, consisting of works where process is vital, in relation to the material, the social and the political. A project of regurgitation vs. representation. Using continuous interaction and discussion, they will develop a collection of outcomes that will be realised through drawing, sculpture, painting and video. For SMF04, Kevin McPhee presents a new online video work that will be viewable for two weeks during June on the Sierra Metro website. A live performance, fabricating and multiplying the techniques of religion at various locations. We think we are free, but we are kept out of the garden by our own fear and desire in relation to what we think to be the goods of our life (Joseph Campbell). Praying is an act that seeks to activate a deliberate communication, a communication to the higher with the aim and concern to render. Meanwhile we are devoured by the big monster of commerce and maybe re-created as stubborn pupils of some faith? Where do these rituals and structures sit within the human evolution today? 'At the same time they never cease trying to escape from what they imagine themselves to be. Their religions are attempts to be rid of a freedom they have never possessed' (John Grey, Straw Dogs). A screening of video work that is particularly aware of its inevitable web based distribution context and uses the language, structure and aesthetics of the internet and computer culture to create works which can exist effectively within the browser window as well as the larger exhibition and screening context. A series of interactive workshops. The only thing you need is your mobile. No preliminary knowledge is required. You will have an opportunity to experience yourself in an unexpected way. The inaugural exhibition of Postal, a publication promoting new and emerging artists and designers working in and around Edinburgh. Contact bgb.sinclair@btinternet.com for more information and an invite. The suburban garden will be installed with multi media art installations – film, 2d and 3d installations, participatory art work and more. Visitors will be invited to relax and take in contemporary art, accompanied with drinks and a barbecue. The suburban back garden context adds a new flavour to the international Biennale scene and takes it, literally, to the grassroots and the community. You are cordially invited to spend a twenty-four hour day with Ortonandon in their mother's home. 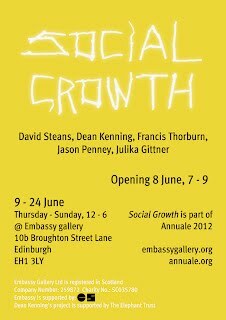 Social Growth is part of Annuale 2012.
various ghosts within these spaces, based on desire and existing automatisms. Lis Rhodes 'Dissonance and Disturbance'. Exhibition runs Fri 25 May - Sun 24 June. Since the 1970s, Lis Rhodes has been making radical and experimental films that challenge the viewer to reconsider film as a medium of communication and presentation of image, language, and sound. 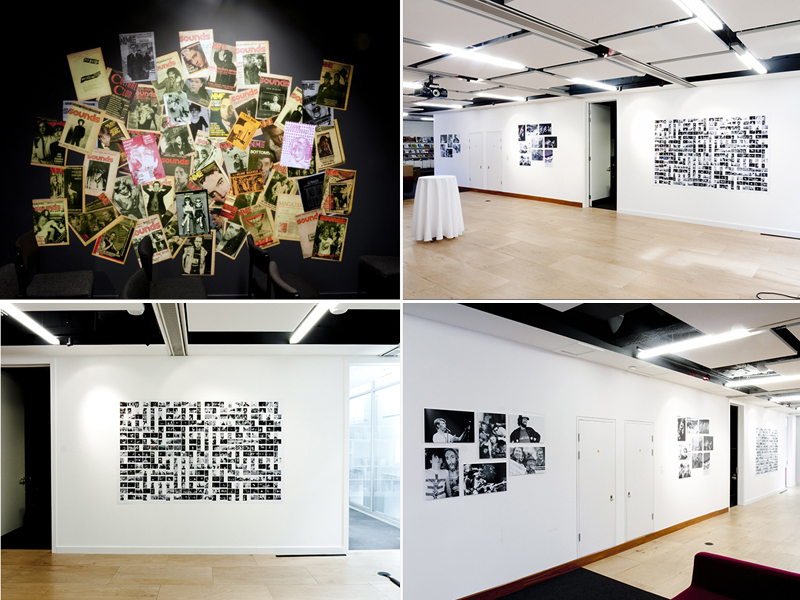 The exhibition, which takes its title from Lis Rhodes' text Dissonance and Disturbance, presents films that encompass performance, photography, composition, writing and political commentary. Films from throughout Rhodes' career are presented here at Tramway, from Dresden Dynamo (1972) and Light Reading(1978), to more recent works, such as the Hang on a Minuteseries (1983-1985) A Cold Draft (1988), In the Kettle (2010) and Whitehall (2012). 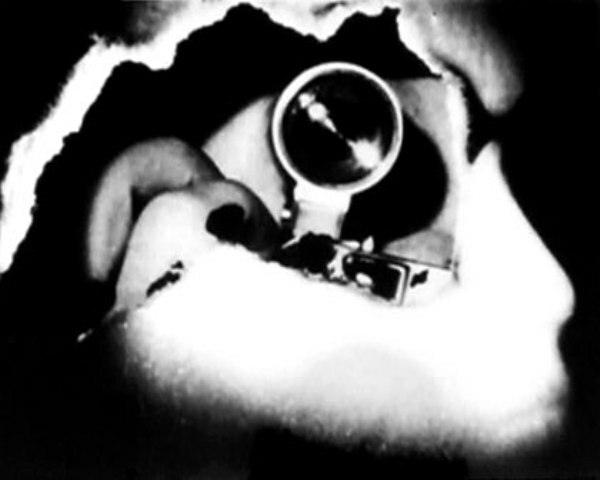 In Dresden Dynamo (1972), a film made without a camera, the physical marks made by Rhodes onto the celluloid stretch where the projector reads the optical soundtrack, resulting in sound drawings in which what is heard is seen and what is seen is heard. Light Reading (1978), has been described as a new direction for film, a technical and aesthetic tour de force of rapid fire editing, myriad techniques and a text which both manipulates and questions the structure of language and representation. Rhodes is presenting her most recent works In the Kettle (2010) and Whitehall (2012), together with A Cold Draft (1988) within a two screen installation for which she is creating a shared soundtrack. Presented in an installation context, Komma (after Dalton Trumbo's Johnny Got His Gun) is a 16mm film installation based on Hollywood script writer Dalton Trumbo's seminal anti-war novel. The project re-imagines Dalton Trumbo's work through its idiosyncrasy – the book was printed entirely without comma's. Set around the time of World War I, the novel with its—then particularly inconvenient—anti-war message, was first published in 1939. The book came into true prominence during the Vietnam war era, after its author had re-emerged from McCarthyist blacklisting throughout the 1950s. The entire book was written without commas, though all other punctuation conforms to established conventions. The term comma is derived from Greek 'komma', meaning 'something cut off.' The installation features a spoken word recording of the novel, white flashes in the film mark the location where commas in the text would of appeared according to the Chicago Style Manual. 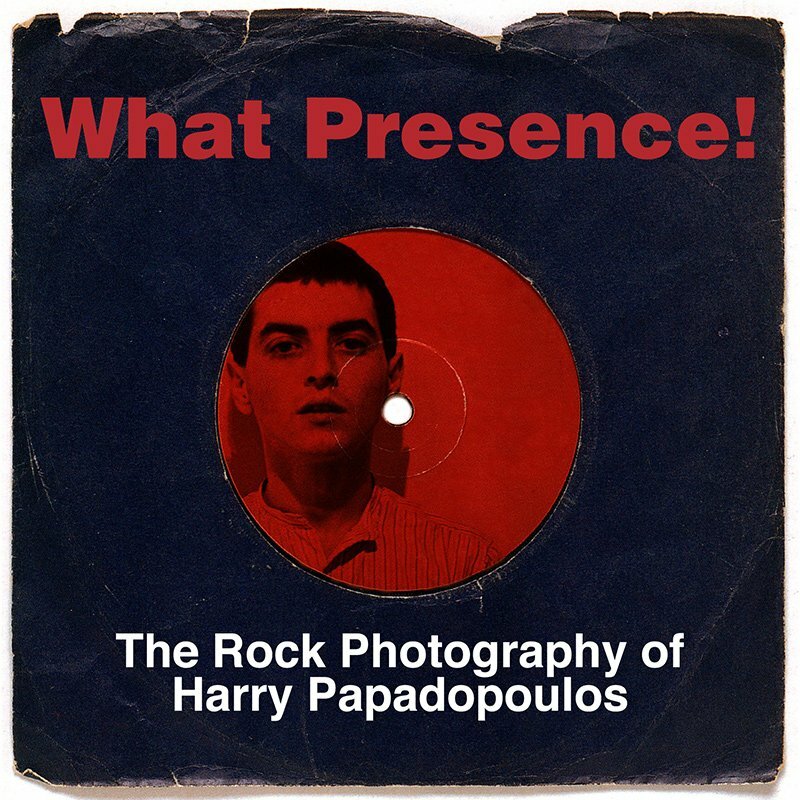 Following the highly popular retrospective at Street Level, 'What Presence: the Rock Photography of Harry Papadopoulos' a new touring version of the show is on display at Creative Scotland in Edinburgh. The exhibition at Creative Scotland includes a number of prints of the Scottish acts he captured in the post-punk period - such as The Dreamboys (featuring Peter Capaldi - years before he learnt to swear and mutated into Malcolm Tucker - looking cute and wholesome as bow-tied front man of Glasgow band The Dreamboys, with favourite US late-night chat show host, Craig Ferguson on drums playing live at Glasgow School of Art), The Laughing Apple (Featuring Alan McGee who went on to form the mega successful Creation Records), Claire Grogan of Altered Images, The Bluebells and Billy Mackenzie, and a number of other luminaries of the pre-punk, new wave and post punk period, such as The Clash, Bowie, Specials AKA, Gil Scott-Heron, and the militant gay triumvirate of Jimmy Somerville, Tom Robinson and Andy Bell (shot before he went on to become a member of Erasure) as they march for homosexual equality. The exhibition includes a large selection of the works plus a digital slide show giving scope to the all of the works that are in the collection of Street Level. Front covers of Sounds, NME's, and a number of Scottish fanzines are wallpapered in the adjacent room, giving a flavour to the time of the late 70s and early 80s. Our annual graduate show THEY HAD FOUR YEARS showcases artists selected from the previous years Scottish Degree Show. CALVIN LAING (Edinburgh College of Art) focuses mainly on performance; looking at the potential of objects and situations. Ideologically revolving around the concept of reporduction of performance, Laing is interested in playing with the perception of reality and creating false elements within reality. Using himself as a ready-made object and interacting with the given environment, Laing will present new work that captures and preserves the visceral immediacy of a live performance as it is transferred into another medium. awareness of movement and encourages us all to 'move a little bit more'. NEIL NODZAK's (Duncan of Jordanstone College of Art & Design) work is ultimately concerned with the intention of creating a visual representation of hypothetical spaces in constant flux. Nozdak will present 'a real life version of something that should only ever have existed as an idea'. An off-site project featuring new work by Michelle Hannah, including a performance downstairs at The Phoenix on 18 June. 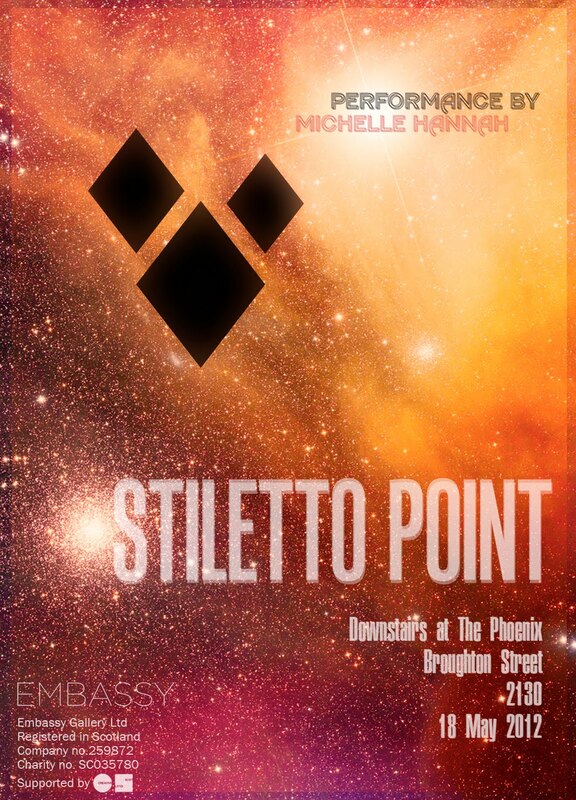 As well as this, video work will be screening at Elm Row Post Office from May. we are in touch with which are relevant to the photography sector. FORMAT Photography Festival is looking for a Coordinator to organise the administration and support the delivery of the 2013 edition. Working closely with the FORMAT Artistic Director you will be managing schedules and updating systems, supporting the development of and delivering on programme areas as well as managing the FORMAT Assistant and Festival Volunteers. We're recruiting for a full-time fixed-term role to work closely with the Director and Programme Team to develop and deliver the Brighton Photo Biennial in October 2012. The successful applicant will play an integral role in the development of a programme of activities to encourage participation and engagement. Context: Following a recent successful bid to Arts Council England (ACE), Photoworks has merged with Brighton Photo Biennial, a move which recognises both organisations' proven track records in promoting and celebrating excellence in photography. Purpose of the Post: The Programme & Participation Co-ordinator will work closely with the Director and Programme Team to develop and deliver the Brighton Photo Biennial in October 2012. They will play an integral role in the development of a programme of activities to encourage participation and engagement. The Creative Producer (Exhibitions & Events) is expected to play a key role in developing and producing exciting and critically engaged artistic programmes. Working closely with the Director, he/she will be central to planning and delivery of the exhibition and publishing programme and gallery-based or offsite activities and events (including the international festival in 2013). £14 - 16,000 pro rata, 4/5 days per week negotiable. The Courses & Production Facilities Co-ordinator's role is to ensure efficient and effective administration of Ffotogallery courses and facilities, being responsible for coordination of workshops, classes, assessments and production facilities; proactively marketing and publicising Ffotogallery's learning portfolio and acting as a point of contact for participating individuals and organisations. For more information about our current job opportunities and to download an application pack, Please see our website. The 8th Berwick Film & Media Arts Festival is back this September and already we are making plans for the biggest and most exciting edition yet. The festival takes place throughout Berwick-upon-Tweed and we are looking for volunteers to make it happen! Last year over 40 volunteers of all ages form across North East England and South East Scotland helped to create the most successful to date, showcasing a series of film premières, site-specific installations and new commissions in various heritage locations around the town. Festival volunteers are crucial to the success of the festival; informing the public about events, ushering at The Maltings Theatre & Cinema, helping set up the equipment, promoting activities and creating a fun and enjoyable atmosphere in Berwick upon Tweed. This will make sure you receive all the information on the festival, volunteering opportunities and travel and accommodation packages with no obligation to commit at this time. Redmond Entwistle will discuss his new film 'Walk-Through' which explores the role and value of art education today through the history of the seminal California Institute of the Arts. Walk-Through is a film installation which revisits the history of the pioneering art school where Entwistle studied in the late 90's, the California Institute of the Arts. 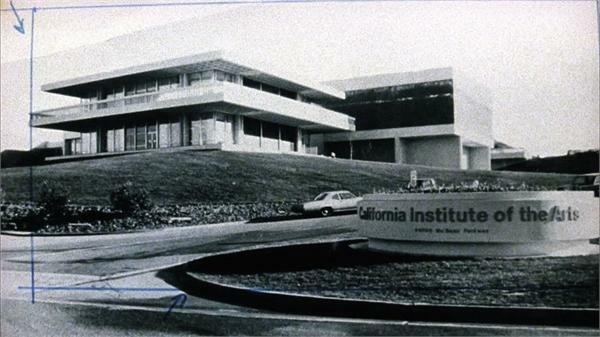 Beginning as a tour of the campus, the film guides us through CalArts' history and the life of the school, from archive images of its design and construction, initiated by Walt Disney in the late 1960's to the present day. Taking the narrative form of a guided tour, Walk-Throughexamines the school's mission, its place in art history, and its flexible architecture, which was designed to facilitate its democratic philosophy. Slowly, however, the tour drifts into a fictional recreation of the 'Post-Studio' class developed by influential artist and teacher Michael Asher in which, instead of analyzing work, a critique of the 'Post-Studio' class itself starts to evolve. David Dale Gallery & Studios are pleased to launch our annual Artist Residency Programme. We are now accepting submissions for our residency opportunity during the summer of 2012. The Artist Residency Programme offers a unique opportunity for an artist, or group to engage in a dedicated period of research and development, within a communicative peer group environment and with the support of the gallery. The successful applicant will have the opportunity to work in David Dale Gallery & Studio's new gallery space, with 24-hour access, over the duration of the six week residency period, followed by a four week exhibition. The successful applicant will also be expected to collaborate with the management committee to develop a coinciding event or supplement to their exhibition. The intention of the residency programme is to provide time and space for the advancement of ideas and production of new work, and to encourage curatorial discourse, networking and professional development. The successful applicant will be provided a material and artist fee of £400, with the gallery managing an additional limited production budget. David Dale Gallery & Studios residency programme has been specifically developed for Scottish based emerging artists and therefore we can only accept applications from artists who live and work in Scotland and who graduated from a higher education institution within the last 5 years. This opportunity is not open to students. To apply, please click here for application form & guidelines. Sherrymite. Prawns Pee event for GI.